For months as we considered our upcoming passage from Seattle to Hilo, we worked on a list of things that HAD to be done before we set off. The list varied in size throughout the spring, but once we reached the boat, pragmatism and schedule reduced the list to a more manageable size. Here is the short list of what we actually completed before setting off in late June. I’ve also added some notes about the usefulness of the repair/update during the passage. – Took delivery of our new mizzen and working jib from Scott Rush and Neil Pryde sails. The mizzen is a ruggedly built 10 oz. Dacron with one reef point and 4 full length battens. It’s a good sail, and it got some use on the passage. The roller furling working jib is also ruggedly built and saw lots of use because we frequently had wind over 20 knots. – Re-rig the mizzen mast. I think this is the first time its been done since the boat was launched, so it was overdue. We used Hayn Hi-Mod fittings at all terminals, and replaced the turnbuckles. We did not replace the running back stays – we are looking for a high modulus rope option. – Added a halyard clutch (Spinlock XTR 0812) to the main mast so we can use one winch for both the headsail and solent stay halyards. – Installed a Little Wonder LWM-145 12 volt watermaker. A hard decision, because we hate complication and the cost was high – but it ended up being a wise choice because we did not have measurable rainfall on the passage. We installed it in the former aft head, adding a strainer (Sherwood seawater strainer 18001) and 20 micron pre-filter before the standard 5 micron filter. We used a Groco SS thru-hull for the discharge overboard. We added an hourmeter so we know how long the watermaker has been used and an Oil Filled Vacuum Pressure Gauge to know when the filters are clogged. The system seemed to work well, but we’re still on the learning curve. We did not replace or clean filters the entire passage, though we used the watermaker nearly every day. – We added twisty “locks” to all cabinet doors because the current latches can fail if something heavy falls against the door. This was a jolly plan. Seemed like anytime we forget to twist a lock, the door would fly open. We didn’t forget often. – We added a wooden bar as a brace in front of the galley stove. This was a wonderful idea from Mary. We also added a “seat belt” to the galley that could be used to lean against when on a port tack. It was useless on a starboard tack, but then the wooden bar was a good brace. We also added an overhead strap that ran from the compression post at the galley to a ring by the head, so there was a continuous handhold through the cabin. Eric used this the most while under way. – Added friction clasps to all floor boards. Fortunately we never heeled far enough to test these. – Added a lee cloth to the saloon single berth, which Van used as his berth almost exclusively during the passage. He couldn’t deal with the noise and movement in our usual bunk in the v-berth. Marilyn was so tired most the time that being tossed around in the v-berth did not disrupt her sleep. – Generally worked on securing everything below deck, and for the most part did a good job. We were not hindered by flying UFOs during the rough passage. – Added a Flexible Solar Panel to increase our charging capacity. Van mounted this on the coach roof. Very nice, yet we still need more charging capacity if we run our instruments 24/7 like we did on this voyage. – Applied anti-glare window film to the coach roof skylights to cut down on heat and glare. – Added a swim ladder so we can get from the water to the deck. We used a Stowaway ladder that we found at a garage sale years ago. Van installed the mounts on the port side through the toe rail. – Installed a simple rubber flapper on the exhaust so that following waves cannot surge up the exhaust line. This is good insurance against a flooded engine. It works well. – Eric and his brother replaced the failed tachometer cable. – Bought 2 West Marine offshore life jackets, complete with harnesses. – Added a Ocean Signal RescueME MOB1 Personal AIS Beacon to the life jackets used by Eric and Van. Fortunately, we never needed to activate either. These nifty devices added peace of mind. That short list seemed to do the job fairly well. Though we did have some failures while under way, none of them were on an early draft To-Do list. The things that actually did fail we had never thought about repairing. 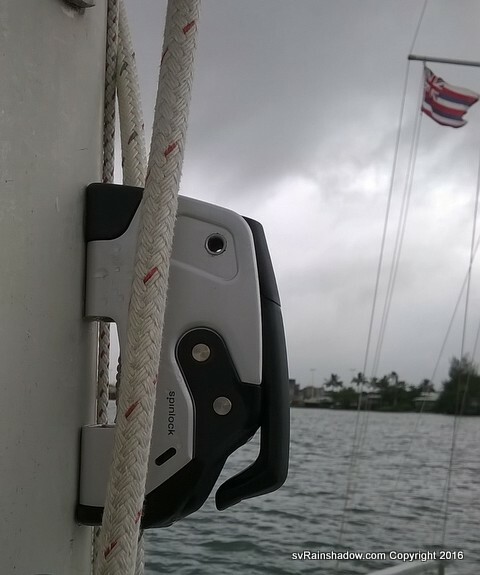 The halyard clutch we added to the main mast so one winch can manage either headsail halyard.